When we tested the Devinci Dixon RC in the September 2011 issue we were amazed and frustrated in equal measures. As we said at the time; ‘Fun, fast and forgiving, the Dixon is a blast to ride and the rear suspension is more capable than most 160mm travel bikes we’ve tested. But the Dixon RC could be a category leader if the BB was lower and the size medium was 15mm longer’. Well, someone from Devinci must have been listening, because for 2013 the brand new Dixon Carbon sees revised sizing that goes a long way to answering our prayers. But before we crunch the numbers, let’s examine the most obvious change in the Dixon; the move to carbon. With Devinci achieving considerable success for its carbon Wilson downhill bike under the pilotage of Stevie Smith this year, it was almost inevitable that there would be a moulded version of the Dixon sooner rather than later. And like the downhill bike, the Dixon gets not only a non-ferrous main triangle but carbon seatstays as well. The important elements of the frame are familiar – 12mm x 142mm Split Pivot dropouts, Axis Link, Full Response Geometry adjust chips and a tapered head tube – but delve into the detailing and it’s far from a carbon copy of the aluminium version. A press fit BB92 shell simplifies construction and saves weight, while the direct mount front mech cleans up the seat tube. Instead of the aluminium Dixon’s splined ISCG adaptor, the carbon frame gets integrated mounts, albeit with threaded inserts that can be replaced in a crash. While Devinci is making a full range of Dixon carbon models, along with a frame-only option, only the Dixon Carbon RX (as seen here) will be sold in the UK. In our original test last year we also complained about the high price of the Dixon, so it’s satisfying to see that the carbon bike will come in at a competitive £3,600, or exactly the same as the aluminium model reviewed in that September issue. Less impressive is that, at nearly 31lbs, the bike we rode is equally comparable in weight. For your 3.5k you get a SRAM 2X10 set-up and a Reverb, but some of the other spec choices had us scratching our heads. For example, SRAM shifters and derailleurs are matched up to a Shimano chain and cassette. And while we applaud any manufacturer willing to spec a 780mm bar, the Truvativ Boobar fitted to the Dixon gives very little room to cut down before you run out of space for the controls. One of the aluminium Dixon’s greatest assets was its ride. In fact it was one of the most entertaining bikes we rode last year. So our hopes were high as we headed up the chairlift to smash out a day of hard laps in the Whistler Bike Park on the new bike. As soon as we swung a leg over the Dixon Carbon we noticed the extra length in the top tube and down tube. Gone was the slightly nervous, cramped dimensions of the medium aluminium bike replaced by a reassuring feeling of stability at speed that really gave us to confidence to open up the taps. We’d still prefer to see half an inch lopped off the bottom bracket height, but the longer wheelbase does help counteract any feeling of being perched. And as a package, we reckon the slack head angle, improved standover height and the stiffness of the carbon frame really unleashes the full potential of the Dixon platform. So, a massive thumbs up for the geometry, but we quickly discovered a shortcoming elsewhere that came like a bolt from the blue. The suspension – one of the Dixon’s greatest assets – simply didn’t perform as it had on examples we’ve ridden in the past. Supple, playful and capable were not adjectives that sprung to mind as we chattered into the first set of braking bumps. Quite the opposite in fact; the Dixon felt sticky and overdamped, sending a tsunami of painful shockwaves to our forearms. Mostly this stubborn, lethargy emanated from the shock, but we also felt some harshness from the fork. Where is the Dixon’s mojo? Well, an educated guess suggests that the Devinci’s move to a Monarch RT3 shock is to blame. It’s a unit we’ve had little success with over the year – firstly on Danny’s YT Wicked longtermer (in RTC3 guise) and more recently on Vitus’s Escarpe. And it seems that even speccing the lightest rebound and compression tune, as Devinci has done, can’t cure the firmness. Our only hope is that production bikes will get a kiss of life in the form of RockShox’s allegedly much improved 2013 Monarch shock. As it stands, the Dixon Carbon RX is half a great bike. Ironically Devinci has cured the criticisms that kept the aluminium bike from winning our hearts but, in changing the shock, has managed to wipe out its greatest talent and lose its sparkle. Needless to say, Devinci is disappointed to hear about the issues with the Monarch, so keep an eye out for updates and don’t expect this to be our last word on the Dixon Carbon. 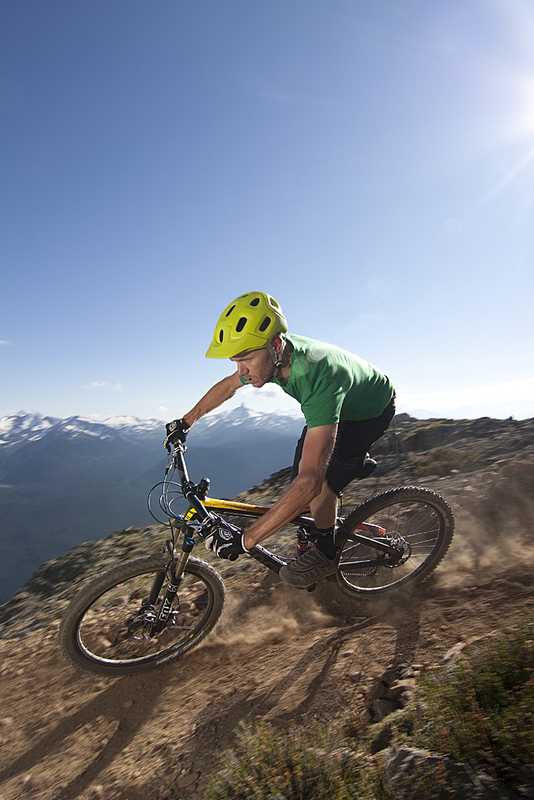 Whistler Bike Park for the Top of the World tickets and Bear Back Biking for the hospitality during our stay in Whistler.